Marc Levers in action against Swindon Wildcats. Peterborough Phantoms chiefs have issued a public apology to English Premier League rivals Swindon. The city club attracted criticism after highlighting a hip-check from Marc Levers - which left Wildcats import Carlo Finucci injured and unable to play any further part in the two teams’ clash at Planet Ice last Sunday (December 6) - as their ‘Play of the Game’ video feature. Levers’ hit, in the first period of a game Swindon won 1-0, was deemed legal by referee Matthew Thompson. But Phantoms have subsequently removed the clip from their official website and social media channels. A club statement said: “The Peterborough DALROD Phantoms would like to apologise to the Swindon Wildcats and any of their fans that found the ‘Play Of The Game’ footage distressing. “Earlier this week we removed the footage from our social media after review, and also apologised to the Swindon general manager, Steve Nell. “In no way was the injury that Finucci incurred due to the clean legal hip check from Marc Levers meant to be highlighted in any way as the ‘Play of the Game’. “The hit itself was the highlight and in no circumstances do we promote this sport to be thuggish or, as Swindon have put it, ‘a boxing match’. “This is a family sport as Swindon also highlighted, and we echo their sentiments. 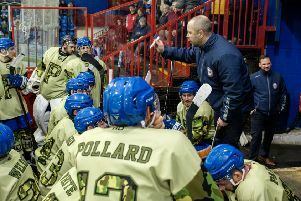 “Peterborough Phantoms are proud that we are a skilled team, and do not rely on excessively using violence to win games. “Understandably, Swindon are upset to see their new import hurt, and as a hockey community we would not wish to see any person injured or in pain on any team. “If the highlight had been cut by five seconds, to take out the footage of the player on the floor, this would have reflected a different story. We have a team of dedicated supporters that volunteer to edit the footage from the games and get this out the same evening. “The PhanTv crew have been spoken to and although this was not done in malice, we have instructed some guidelines going forward.